A couple of months ago, Lalli did a terrific piece on tragic Phils pitcher Charlie Ferguson. Ferguson threw the Phillies’ first ever no hitter, never won less than 21 games in a season, and had Hall of Fame written all over him. 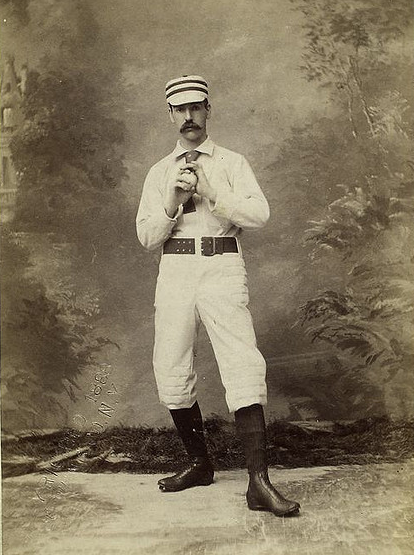 But during spring training in 1888, he contracted typhoid fever and died in late April. Ferguson was 25 years old. The photo taken above was shot just months before his death. Here is a very good piece Frank Fitzpatrick did on him in 2003. Anyways, was just tooling around on flickr and came across this photo and thought I’d share. Something else interesting about Ferguson: he is 8th all time in wins for the Phils, but isn’t shown on their All-Time list on their website.